I am absolutely convinced that God does much more than we realize by people who either think that they are unnoticed in the crowd, are overlooked, ignored and totally discounted. There are many reasons for this of course, sometimes for legitimate purposes and to be honest, there are some people I prefer to see leaving than arriving in my meetings, but I have to love them as much as Jesus loves them. It is very difficult for a preacher to conduct a meeting, when he has to arrange the seating, get his own drinking water, control the lights, set up the sound system, pass out the welcome messages, talk to those who prattle on about nothing or are self-centered and stay tuned into the Spirit of God so he can preach well under the anointing, minister to the people, minister to the Lord and then clean up afterwards! I know that does not happen in your church of course, but it did in mine, week after week after week, despite teaching about the ministries of helps and it is all but impossible to preach when they interrupt and you know all along that the people are not receiving it! Why come at all? Is it for the socialising only? We are social beings and need fellowship, but is that the only motivation? Is it for the promise of blessings? God wants us blessed so much that it overflows onto others and I like to see everyone blessed, but I do not like people coming only to get blessed! Some folk talk the talk but do not walk the walk. They are the people I would rather not see, but they are part of the family of God so I have to love them. Jesus does! We need everyone, whether they are pew warmers and time wasters, real people who will roll their sleeves up and get dirt under their fingernails for the work of the ministry, or come to church expecting to be waited on! Iv’e had them all too. It does not matter if you are short or tall, fat or skinny, hairy or balding, good singers or sing off key and often very loudly! God loves us all and that is a wonderful thing that I would not have otherwise. Anyhow, there are people in all sorts of places, doing things in the Kingdom of God that rarely get a mention by others, but we need them. We need everyone in the church in their right place, doing the right things and at the right time. Have you stopped to consider what would have happened if a certain person was not doing what he or she was created to do, or if someone never made it to a particular place at the right time? Sometimes we call them chance encounters, but there are no chance encounters in God. Think what could have happened if Joseph had accused Mary according to the Law and she had been stoned or if he had refused to marry her. Imagine the person that Mary and Martha sent to Jesus with the news that Lazarus was ill, not finding Him or not going because it was too far away, or to hard, or too hot. Imagine what may have happened if his friends had not told Nathanael about meeting Jesus. I once wondered what could have happened to me if two people did not invite me to a crusade in September 1968 and I had not been born again. Think about your own life for a minute. Is there one of those situations when someone just happened to be there when you really needed someone to be there. The only thing I know of that can stop one of those chance encounter situations from fulfilling its intended purpose is disobedience. Sometimes God picks a man or a woman who never seem to get a lot of credit for what they do by other people, but their task could be one of the most important tasks imaginable. On many occasions the bible does not even mention their name, but God knows their name. I am sure you will find many phrases like A certain man many times. A search in my bible revealed at least 175 occurrences. We often see text where God sent a prophet. In Judges 6:8, God sent a prophet to proclaim the word of the Lord and Gideon was raised to deliver the people. We do not know this prophet’s name, but God does. Look at some New Testament examples. When they came near Jerusalem, to Bethphage and Bethany, at the Mount of Olives, Jesus sent two of his disciples ahead of him. He said to them, “Go into the village ahead of you. As you enter it, you will find a young donkey tied there. No one has ever sat on it. Untie it, and bring it. If anyone asks you what you are doing, say that the Lord needs it. That person will send it here at once.” The disciples found the young donkey in the street. It was tied to the door of a house. As they were untying it, some men standing there asked them, “Why are you untying that donkey?” The disciples answered them as Jesus had told them. So the men let them go. Mark 11:1-6. I do not know who those disciples were. Neither do I know who owned that donkey, or who those men were, but every one of them played a part in the build-up to Calvary, when Jesus rode into Jerusalem on the back of that donkey. I want you to see something important here that is often overlooked. Did you know that He has needs? See something else now. God provided in advance for the meeting of that need. It was there, waiting for Jesus, just as He said it would be. If you are on an assignment, you can rest assured that the provision will be there for you, perhaps not when you want it, but when you need it! Perhaps the Lord told another person to take that red car to the same point and give it to the person who arrived for it. If either of you procrastinated, questioned, or disobeyed instructions, the desired plan of God could be thwarted. I know that these things work, because they have happened to me and happened more than once. I do not advocate that you try this, but I think of a time when the Lord told my wife and and me to pack a suitcase and go to the airport. He told us what time and what flight, so we went. I approached the reservations desk and asked if there were tickets for us and sure enough they were there! The tickets were there waiting for us just as He said they would be, but they had not been paid for. We waited as per instructions and watched that flight take off to its destination. One person obeyed his or her instruction, but another person disobeyed the Lord! We later found answers to our questions. The person who should have been there to pay for the tickets was disobedient and our ministry trip failed. Do you know that God has already made provisions for your needs? Every need you have in your life is met based on obedience to God's instructions. When you obey God without questioning or reasoning, no matter how strange His instructions may seem, the provision will be there to meet your need. We just saw this in the story about the donkey. I now want to take you to a very important incident. On the first of the Days of Unleavened Bread, the day they prepare the Passover sacrifice, his disciples asked him, "Where do you want us to go and make preparations so you can eat the Passover meal?" He directed two of his disciples, "Go into the city. A man carrying a water jug will meet you. Follow him. He will show you a spacious second-story room, swept and ready. Prepare for us there." Mark 14:12-15. These two disciples were sent on an assignment. Jesus knew in advance where this man was and He knew what he would be doing. They had to go in an act of faith and in an act of obedience. What if they heard wrong? What if that man wasn’t there? What would have happened is he or the disciples were late? This whole story is strange, because men did not usually go around fetching water! That was women’s work! He shouldn’t even have been doing that! Why was he fetching water? Jesus told the disciples to follow that man. He was the man with no name. Apparently they were not even to ask him any other question. Their instructions were to ask the owner of the house and no one else where his guest room was located so that they could share the Last Supper. Those men didn’t know it was to be the Last Supper. All they knew was that they were going ahead to prepare for Passover. Again we see that Jesus had a need and that this need was already met before He sent His disciples. Again, if you are on a God-sent assignment, you can depend on he fact that the needs will be prepared in advance. Please notice that the owner of the house had already cleaned the place and set the table in readiness for them. 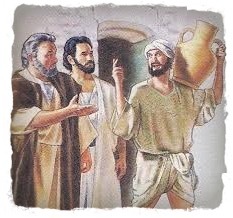 Who was the man with the pitcher in his hand? I do know however that the most important event in human history depended on two unnamed men, doing what they were destined to do, in the right place at the right time. Imagine the outcome if either of them had refused to comply. Imagine what may have happened if those disciples had goofed off. You may not think that you are anyone special, but you never know what you may accomplish in the Kingdom of God. Your whole life’s achievement may be only to talk to one other person in life and win him to the Lord. That might not seem like a big thing to your, but what if that persons happened to be another Paul, or a Billy Graham, A Reinhardt Bonnke, or a Benny Hinn? Having said this, I must also say that pastors need to be careful and I am a pastor myself. Do not become too big, or too full of your own self importance to reject others. That man you ignore could be a "man with no name". I know that we can be busy and that we cannot spread ourselves out to everyone. I know that there are some people who are just plain time wasters and want attention, but please do not fall into the trap of becoming too big or too busy to be approachable. No one is that busy all the time. No church program is more important than a precious soul who could be offended and turn away from the Lord because of someone’s pride and arrogance, or sometimes by being a control freak and domineering, but many pastors regularly do this. It’s been done to me before and it will happen again. I am very mindful of the Lord’s words to me several times, “Don’t you dare do that to anyone”, when I observed the way some pastors operate. MY BRETHREN, pay no servile regard to people [show no prejudice, no partiality]. Do not [attempt to] hold and practice the faith of our Lord Jesus Christ [the Lord] of glory [together with snobbery]! And you pay special attention to the one who wears the splendid clothes and say to him, Sit here in this preferable seat! while you tell the poor [man], Stand there! or, Sit there on the floor at my feet! Are you not discriminating among your own and becoming critics and judges with wrong motives? Listen, my beloved brethren: Has not God chosen those who are poor in the eyes of the world to be rich in faith and in their position as believers and to inherit the kingdom which He has promised to those who love Him? Is it not they who slander and blaspheme that precious name by which you are distinguished and called [the name of Christ invoked in baptism]? On one of my crusades in India, my hosts had hired a large venue and I went down off the platform to lay hands on people. I won’t do it like that again. They mobbed me! Everyone wanted to touch the preacher. I had placed my hands on one person, when another woman grabbed my hand and placed it on her own head! She wanted the man of God to touch her of course, but such a thing could “break” the anointing. Think of yanking an electrical lead of an appliance out of the wall socket. The power is severed. Whilst I am touching on this, may I recommend to pastors when praying for people that you do not always seek for them to fall under the power of God. If that happens...it happens, but please do not make that a “proof” that the anointing is there. Sometimes it is better to maintain the contact so that all of the “anointing” can flow and not be prematurely severed! Think of it. Allow the Holy Spirit to continually lead you and not fall into a habit pattern. People brought their little bottles of oil so that I could anoint them with their own oil and that meeting went crazy, but in a nice way. God did move! The youth group came to my rescue and surrounded me and things went smoothly from then on. I agree that screening is sometimes desirable, but not to the point when the preacher insulates himself from everyone else. He or she needs to protect the anointing of course, but I am not talking about that! I am talking about plain rudeness! Please do not fall into the trap of becoming too big or too busy to be approachable. No one is that busy all the time. The Lord once told me, “Robert, if you are too busy...you are too busy”. There is a good lesson in that. Look however at what you may achieve by being obedient. Now there was in Damascus a disciple named Ananias. The Lord said to him in a vision, Ananias. And he answered, Here am I, Lord. And the Lord said to him, Get up and go to the street called Straight and ask at the house of Judas for a man of Tarsus named Saul, for behold, he is praying [there]. Acts 9:10-11. The Lord called a man called Ananias. Did he conduct massive crusades? I think not. Was he the pastor of a very large church? I doubt it. I cannot find a youtube video of his meetings or one of his books in a Christiaan bookstore, but his influence was massive. Are you a disciple of Jesus? Imagine this conversation. The Lord said, I want you to go to Saul. He replied No Lord. He offended Me. He didn’t say hello to me at church last Sunday. He hurt my feelings. He never gave me a seat up front, or invite me into the pastor’s private meal with the visiting preacher. He did not give me what I expected. No! If he had that attitude, most of the New Testament might not have been written! I am so glad he obeyed. There is also another aspect to consider. Many people go around looking for the man with the water pot, or the bucket of money, or the blessing, or the word of encouragement. Sometimes in so doing they make that other person their source and not God. Instead of you looking for that man, why not become that man yourself? Many people I know are in it for what they can get out of it. Don’t be like that. Be a bless-er. Be the man who owned the house or the man who fetched the water. Be the man with no name.